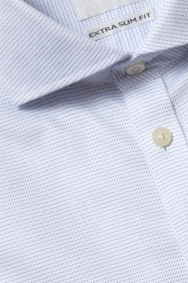 With its spot pattern, cutaway collar and extra slim fit, this shirt takes sharp style to the next level. It’s cut to give you a chiselled frame by sitting close to your body. The 100% cotton material is treated to make it zero-iron – it means you can simply wash it, hang it up and wear it – the treatment uses your body heat to remove creases. Wear this shirt with a tweed-inspired suit or a blue one with a bold pattern, like windowpane checks, for a smart and on-trend outfit. You’ll need a tie to fill the cutaway collar. 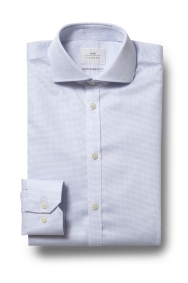 The sharp cut of an extra slim fit shirt is designed to flatter your physique and create a contemporary aesthetic. With a close fit around the back, chest and shoulders, an extra slim fit is ideal for a confident man. It’s the perfect partner in crime to a skinny fit suit for formal occasions or to dress up a pair of jeans for an evening out. Although it says non iron, I did still have to iron the shirt, although no where near as much as I would ordinarily. In addition the shirt is quite heavy, and I may not be able to wear during the summer as I over heat quite easily. However lets see. At the moment, I am happy with the quality and fit of the shirt.